The Derbyshire landscape has long inspired artists and writers: there is ‘no finer county in England than Derbyshire’ declared Jane Austen in Pride and Prejudice. With his new series of 30 richly painted canvases, Jeremy Bournon joins a long tradition of painters who have been drawn to depict the region’s beautiful countryside. His solo exhibition ‘Derbyshire Landscapes’ captures the colour, contours and geometry of South Derbyshire, and can be seen from 3rd – 17th September at Ingleby Gallery. Many people will know Jeremy Bournon for holding the esteemed position as Head of Art at Repton School, which he did for 30 years. He originally trained as a sculptor at Wimbledon School of Art but began to paint under the influence of the Derbyshire countryside whilst teaching at Repton. Since retiring, and following a stint as Artist in Residence at the school, he has devoted his time to painting full-time; his studio in Willington is filled with canvases showing experiences of walking in and travelling through South Derbyshire. Journeys are a common thread in Jeremy’s work and his landscapes often feature the road ahead, a path, stream or hedgerow. He explains: “What I love about the South Derbyshire landscape is the wonderful interlocking shapes and the natural geometry which leads your eye into the distance”. A number of the paintings, such as ‘Turn of the road: B5023 towards Wirksworth’ feature the road from Kedleston to Wirksworth: “I was hunting for my motif for the Ingleby exhibition when I was introduced by a friend to Alport and I knew straight away the view from the top was perfect. The landscape had everything I look for in composition”. Throughout this series of paintings is the artist’s evocative use of light, much of which falls across the landscape from dramatic skies. There is a debt here to the 19th century British landscape painters, with bold juxtapositions of dark and light. 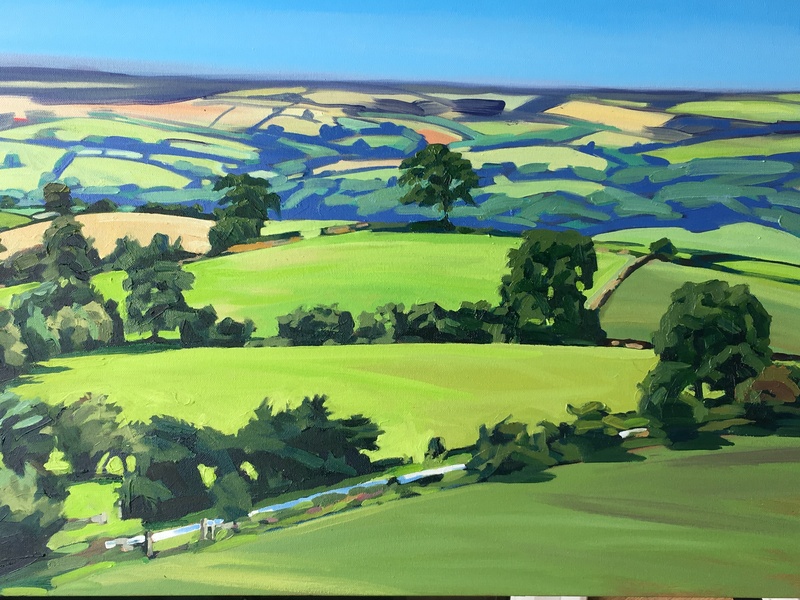 In ‘Cloud formation over Alport Heights’ he plays with traditional perspective: the landscape has been painted in portrait format and two thirds of the canvas make up sky. Manganese blue breaks through the large, grey clouds (which make painting sky look effortless), resulting in mesmerizing streaks of light amongst the dark hillside. It is works such as this which show Jeremy’s painterly skill and ability to reinvigorate the landscape in a study of light and atmosphere. At the same time, there is also a move towards abstraction in many of the paintings, in which Jeremy explores colour, geometry and the natural patterns in nature that fuel the compositions. These pictures recall the early landscapes of Piet Mondrain, in which he incorporated farm buildings into the landscape with broad, thick brushstrokes. Others, such as ‘View across the Ecclesbourne Valley from Alport Heights’, masterfully evoke Paul Cézanne’s planes of colour, with which he created complex fields. With this superb show, Jeremy Bournon makes the tradition of landscape painting contemporary, immersing the viewer in his emotive rendering of Derbyshire’s distinctive countryside. As part of Jeremy Bournon’s ‘Derbyshire Landscapes’, there will be work on show from painter and illustrator Christian Birmingham and photographer William Bye. Jeremy will be giving an evening talk at 7pm on Tuesday 12th September entitled ‘The rise of the 19th century independent landscape artist’.